Is your garden looking a bit shabby, are the weeds taking over or your having trouble keeping the water up to your plants? Then you need Shuker Farm hay mulch. Hay mulch will enhance the look of your garden, smothers weeds and insulates the soil acting like a sponge to soak up water and then slowly releasing it back as your plants need it. Hay mulch comes in convenient sized bales that are easy to move around and place where they are to be spread and unlike other types of mulches our hay mulch has no nitrogen draw down affect. We deliver to your gate or if you have a Ute, trailer or truck then come on down and pick some up yourself for a great discount rate. 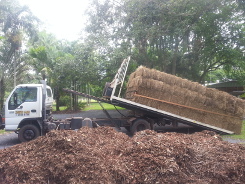 Click here to order your mulch online, we provide both home and bulk delivery. Hay can be collected directly from 1055 Mira Road South, Darwin River, N.T. 0841 all year around at $5.00 per bale. No minimum or maximum.